The British Divers Marine Life Rescue Team search for the common seal at Topcliffe. 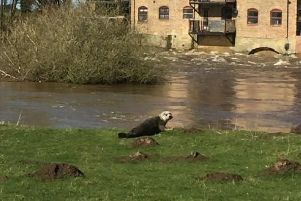 The now famous Seal of the Swale looks to be enjoying its celebrity status as hundreds of extra visitors are pouring into one of angling’s most famous hot spots at North Yorkshire’s Topcliffe village just hoping to catch a glimpse. Watching from the bridge, onlookers and anglers smiled as attempts to capture the 17-stone common seal were treated as a fun day out by the mammal that obviously hadn’t read the script. Well-laid plans by the Marine Life Rescue Team to use boats and divers to persuade the beast from its upstream resting place in the weir pool to waiting nets placed in the shallow waters running under the bridge, proved better in the planning rather than production stage. The seal looked to be in total control as it teased its rescuers and performed for the crowd before disappearing back to where it came from minutes earlier, suggesting that boats, wet suits and flippers will be no match for something resembling a blubbery sea-going missile. Though I wish the rescue attempts a success – and know they have a plan B – personally, I can’t see it happening and would predict that the next time our visitor sees the Humber Estuary will be under its own steam after the next floods, probably wondering what all the fuss was about. The effects of its feeding are plain to see with fewer chub and barbel visible from the bridge than usual, and the sardine-sized dace and chublet shoals are alarmingly absent. Let’s just hope that this most-famous piece of the River Swale is healthy enough to recover. Chapel Allerton’s Andy Hampson, meanwhile, suffered heartbreak and a massive dint in his wallet at the weekend by just missing out on one of angling’s most prestigious prizes. The Fermanagh Angling Classic, held over three days on the Lough and River Erne system around Enniskillen, is still the most famous and ‘one to win’ of all the Irish wild-water and river festivals. Hampson made the perfect start, winning day one with a stunning 32-650kg catch of prime hybrids from peg 15 on the town’s Cornagrade section. All of his fish fell to 11-metre pole, loose-fed caster, cupped in chopped worm and the standard double black caster on the hook. Surprisingly, his second-day catch of just over a kilo was enough to keep his place at the top of the leader board, and with the system’s shoals becoming hard to find he went into the last day as a firm favourite. The Classic’s curse of not wanting final-day leaders to actually win the event struck at the draw bag. As the Leeds angler went to his designated peg on Lough McNean, knowing that it hadn’t produced a single bite or fish for over a week! His final-day catch of six long-distance, feeder-caught roach for 700g fell just short of what was needed. And, as the boards were tallied, Barnsley’s in-form Tony Hopkins came from behind to win by the narrowest of margins and take the coveted crystal trophy and major brown envelope containing £5,000. Fermanagh Angling Classic, Lough Erne: 1, Tony Hopkins, Gowna 36-245kg £5,000; 2, Andrew Hampson, Chapel Allerton 34-580kg £2,000; 3, Stuart Hartford, Worcester 27-560kg £1,500; 4, Stefan Engert, Rohrheim 27-540kg £1,000. Fleets Lane, Aire & Calder: 1, T Layfield 22-05; 2, M Hammond 20-03; 3, C Musgrave 10-10. Kippax Park, Lapwing: 1, P Cromie 104-05; 2, T Hewson 90-11; 3, S Pearson 85-13; 4, A Broomhead 76-02. Moor Monkton Pools, Rover: 1, D Pollitt 102-10; 2, S Mazza 95-08; 3, A Bull 89-02; 4, S Jeffreys 75-03. Colton Sports, Poppleton Railway: 1, M Durkin 95-05; 2, K Foster 93-06; 3, D Slawcarm 88-04; 4 K Gale 83-12. York Nomads, Horseshoe Poppleton: 1, D Scratchard 127-10; 2, D Rollinson 108- 12; 3, R Morris 74-12; 4, G Peak 73-14. Hawksworth AC, Raker: 1, M Langdale 72-08; 2, B Mensah 62-08; 3, J Walker 52-11. Hawksworth AC, Brafferton F1: 1, M Smith 40-01; 2, B Lee 38-06; 3, W Hall 28-02. West Yorkshire Wagglers, Viking Fox: 1, R Starke 28-03; 2, S Hobson 23-12 ; 3, J Breirley 23-09; 4, A Howsham 19-12. AJ Tackle, Tollerton: 1, W Knock 95-05; 2, G Thornton 92-03; 3, T Horncastle 88-07. 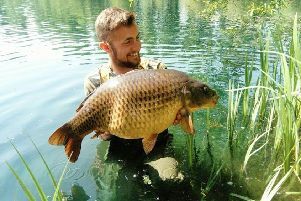 AJ Tackle, Barnburgh Lake 3: 1, A Burdeken 83-09; 2, N Brown 72-05; 3, B Parle 67-12. White Horse AC, Ben-Lee Fishery: 1, P Sharpe 40-10; 2, I Day 35-14; 3, G Edwards 12-02; 4, J Jones 11-0. Listerhills AA, Moor Monkton Pool:s 1, D Jackson 36-01; 2, E Harrison 21-13; 3, G Reeday 13-08. Kippax Park Fishery, Lapwing: 1, D Wright 64-14; 2, J Kenning 57-07; 3, P Cromie 51-07.; 4, T Hewson 46-05. JT Rodgers, Redwood Park B/Lake: 1, D Watson 86-02; 2, A Jackson 71-02; 3, D Ball 59-10. JT Rodgers, Brafferton Island: 1, D Watson 79-02; 2, S Clegg 78-05; 3, D Ball 71-05. Dragon AC, Candy Corner AJS Pegs 1-20: 1, Danny Doyle 105-04; 2, Terry Doyle 75-05; 3, Dale Evans 54-07; 4, Kevin Legg 53-14. Armley AC,Redwood Canal: 1, CC Greenwood 65-02; 2, Jim 63-04; 3, D Wilson 39-12; 4, P Howard 37-04. Ponte Old Boys, Vikings Deer Tuesday: 1, J Sims 148-08; 2, R Evans 74-04; 3, L Gallivan 62-08; 4, J Holmes 60-00. Rodley Nomads, Viking Hawk Wednesday: 1, B Lockwood 147-10; 2, E Holmes 127-02; 3, C Parker 98-02; 4, M Bell 93-12. Viking Saturday Open, Hawk: 1, C Smart 69-09; 2, J Brown 65-09; 3, T Bullass 57-02. Outwood AC, Viking Deer: 1, M Smith 72-15; 2, J Clement 52-00; 3, A Branson 47-04. Blankers AC, Viking Fox: 1, J Brown 120-12; 2, D Hoggard 78-08; 3, R Scott 73-08; 4, S Hoyles 64-06. Rodley Barge, Viking Hawk: 1, M Bell 94-10; 2, R Brook 74-15; 3, S Wilson 64-12; 4, D North 58-10. Angel Lakes, Sunday Lookout: 1, John Dryden 178-09; 2, Norman Laing 138-01; 3, John Foster 102-12. Angel Lakes, Friday Bowes: 1, John Foster 257-02; 2, John Nelson 161-12; 3, Ethan Bradley 153-05. Birkwood Farm: Emily’s or Oscar’s, draw 8.30am, contact 01924 892251. Viking: Saturday Open, Deer Pond, 24 pegs, £16, contact 01405 785206. Tollerton Ponds: Open Match, all ages, (Kingfisher 20 pegs, Coot 18 pegs, Heron 32 pegs), contact 01347 838115.